Typically, many homeowners just put up with and expect to hear the garage doors moaning and groaning when being opened or closed. However, if the garage door is increasingly noisy, and sounds like it is reaching the breaking point, a little garage door lubricant might be what the doctor ordered. After all, mechanical parts in a garage door do experience wear and tear because of element exposure, and frequency of use. There is no excuse to neglect adequately lubricating the garage door as needed, only because it saves money and time in the long run. Repairs and replacements for garage door parts can be a hidden cost, if one does not take preventative maintenance, or neglects to check up on their garage door's health. There are two types of lubricants that are commonly used to treat and clean up a screechy garage door. Usually, garage owners find the best results with either using silicone or lithium grease lubricants. And no, you will not want to run out and spray on the WD-40, because it is not the best option for your garage door. However, there are products from WD-40 that are explicitly formulated to coat and protect the working parts of a garage door to reduce grating noises. It should go without saying, but it is important to realize when your garage door needs some lubricant and attention. Of course, if it sounds like it is struggling to open or close, makes loud wheezing, rattling, or other troubling noises, lubricant, and a tune-up may be needed. If you see or hear the following regarding your garage door, it may be time to break out the lubricant and your tools to remedy the problem. Regularly applying garage door lubricant to integral parts of a garage door can help reduce the amount of noise coming from your garage door, and enables it to run more smoothly. Additionally, it is good practice to check-up on your garage door and see if any parts need readjustment or re-tightening. When applying lubricants to seals, gaskets, and other rubber parts, it is better to use a silicone based lubricant. Lithium lubricants may feel a little bit heavier and are better used on metal parts of various appliances. When in doubt it is good to see recommended types of lubricants for the parts which need an application for reduced friction and smoother operation. After considering carefully the qualities that are most effective in a garage door lubricant, reviewing brand reputations, ingredients used in products, and customer reviews, we come up with the list of best products for you to select. Each product was scrutinized for its performance, price point, and quality of results after being applied by real-life customers just like you. When it comes to selecting lubricants that will help protect and preserve the lifespan of garage door parts, every garage door lubricant is not created equal. Your garage door needs as much love and attention as the car and other household items that your garage protects from the outside world. Treat your garage door appropriately with a garage door lubricant that helps keeps working parts in smoother operation, with less noise, less strain, and improves optimal performance and shelf-life. This food-grade safe heavy duty lubricant doesn't run or drip during application. When applied to your garage door parts that are in need of attention, it helps reduce unwanted friction that can create harsh grinding sounds and wear-and-tear. The base of this lubricant is a combination of PTFE and PTFE micro powders which are capable of protecting parts against rust, corrosion, and can handle exposure to temperatures ranging from -45 degrees F to +450 degrees F.
This lubricant is tough, as it does not separate, or breakdown when it makes contact with salt water. Perfect for lubricating Chamberlain opener gears. This lubricant stands out because it is white, so you can keep track of where you are applying the grease to various working parts. Screw type garage openers are better served with this multi-purpose lubricant, which comes in 1.76-ounce tubes. It's nice working with this easy to apply lubricant when coating plastic gear s and other moving parts. There is no strong or offensive smell emitted during application, and a little bit of lubricant goes a long way to protect your parts. This grease was formulated to apply to garage door parts, hinges, springs, and openers to improve function and protect against corrosion and damage. When applying this lubricant, you'll find that it has a white and creamy appearance, and it lasts long after an application. Applying this to mechanical parts in your garage door, vehicle, and other appliances help to reduce wear and friction. 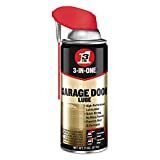 Lovers of WD-40 can rejoice because this is a lithium grease spray lubricant that is better applied to a garage door than the beloved and familiar WD-40 original. Each application sprays onto metal parts in a liquid form, and then readily dries to form a protective barrier that reduces the chance of corrosion and rust damaging working parts. This spray provides a thick layer of protection that doesn't come off easily, coating hinges, tracks, pulleys, and more. The WD-40 company and brand have been around for many decades, and are trusted to offer products that get the job done right. Take care when applying to garage door parts, as the spray may run a bit, and the nozzle can be damaged if not cautious. This lubricant is available in an 11-ounce bottle, providing plenty of lubricant for numerous applications to metal working parts in your garage door and beyond. The grease has a thick body that stays put on applied surfaces, and the lubricant offers a layer of much-needed protection against oxidation, rust, and moisture which can cause corrosion. Even in extreme temperatures, this white grease with a minimal odor stands up to the challenge of keeping parts in working order with less friction, and a protective barrier to enhance longevity. This lubricant is practical on commercial and residential garage doors, providing a layer of protection that minimizes friction between moving parts. When applied to the pulley, tracks, hinges, and rollers, this lubricant helps reduce the chance of sticking, so things operate more smoothly. Corrosion is abated when this lubricant is applied, and tiresome squeaks and grating noises are reduced. You may appreciate that this lubricant is made to dry quickly, so there is less worry about dirt or dust building up on parts after application. This lubricant is ready to be applied to garage door parts when you are, as it comes outfitted with a fixed nozzle for precision application. The formula has been created to reduce rust build up on tracks, and improves the overall performance of your garage door and other appliances. This formula does not contain any harmful solvents or components such as CFCs or HCFCs. You can apply this lubricant with confidence, as it doesn't drip or run like other lubricants. Dura-Glide is a silicone-free lubricant which comes in a clear form, so it reduces the chance of unwanted staining during application. For your convenience, you can find this lubricant in 5 ounces or 16-ounce cans, and it provides long-lasting lubrication after being applied to garage door parts. The nozzle is adjustable so you can better control the flow and amount of lubricant that you need, creating a scenario where you have greater precision and coverage for your tracks, bearings, hinges, and other parts that need lubrication. If you are more conscious about environmental impact and the products you need around the house and garage, look no further. This lubricant is created using eco-friendly materials, and the formula is non-toxic and food safe. This odorless lubricant is readily applied via a spray bottle with a nozzle at the end, and it provides long-lasting protection against rust and elemental damage to metal parts. There are no VOCs emitted from applying this lubricant, and it is safe to use without having to worry about ventilation concerns, or if there are pets or children nearby. The consistency is a bit oily to some, and it shoots out more like a stream than a spray. However, this lubricant does get the job done without using harmful elements found in common lubricants for garage doors and other parts. 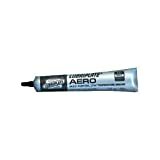 This lithium -grease based lubricant comes in an aerosol can for an application. A nozzle attachment comes with the can, so you can apply lubricant in tight areas that need reduced friction. Each application of 3M's lubricant leaves behind a heavy coating on metal parts that helps protect against corrosion, rust, and allows for smoother movements with less friction. If the lubricant makes contact with rain, sleet, or snow, it doesn't easily wear away or wipe away. Depending on your preferences for silicone or lithium based grease lubricants to smooth out your garage door, your choice of a quality product may vary. Overall, the expected experience for a garage owner is to tighten up loose parts for a garage door occasionally and to apply lubrication as needed routinely. Making sure to regularly commit to the upkeep of your garage door with appropriate lubrication materials, and not using WD-40 outright, can help restore the operational quality of your garage door. Your garage door should be as much as an investment, as the things that it protects. Proper maintenance can drastically improve the lifespan of working parts of a garage door and can lessen living with harsh noises coming from the garage.